Stop the relief staff ring around. When a staff member calls in sick, does it give you a sick feeling in the stomach as well? or SMS messages and an agonisingly long wait for call-backs. We created Schrole Cover to solve this problem, once and for all. If your business or department often needs to quickly organise replacement staff or mobilise an additional workforce for a project, Schrole Cover will be invaluable. We have extensive experience with industries including education, health, aged care, hospitality and more. 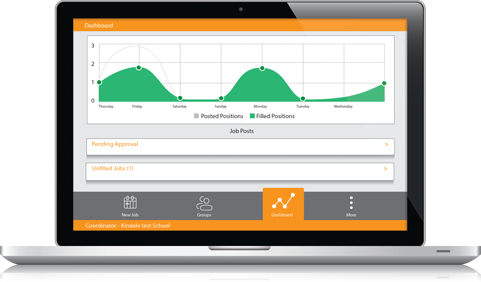 Best of all we've leveraged our experience to create ready to use templates with predefined job descriptions, preferences and escalation timings, so you can get started quickly and customise them to suit your individual needs. Schrole Cover is easy to set up. You simply enter the details of your preferred casual staff and use the options to categorise them by job role. You create priority lists for each role. The candidates are invited to download the free app to make themselves available for casual work from your organisation. 2.Open the app. Select the job role, location and required time. 3.An alert notification goes to your preferred tier of casual staff. They have a set time to respond. 4.If your Group A people don’t respond in time, the notification goes to your 2nd preference group, and so on. 5.The first person to accept gets the job. Everyone else receives a notification to advise that the position is filled. We understand that making change in a big organisation can be hard. Experience tells us the pain is worth it - existing Schrole Cover customers have created significant time and cost efficiencies for the businesses they work in. Sign up for a free trial and we’ll assist you with your change management process. And when everything goes smoothly, you’ll be the one covered in glory.